Sensationalist photographer Jill Greenberg got herself in a whole mess of controversy last week and lost her paycheck besides when she forced The Atlantic to issue an apology, after Greenberg posted photos from her shoot with Senator John McCain and later boasted that she deliberately directed him into appearing in positions and lighting which she could use to make him appear as old and creepy. It was unfair, it was a dupe, and I’ve never been wild about her photos in any event (she was assailed in 2006 for her series, End Times, which featured strikingly vivid pictures of crying children, which she captured by quite literally taking candy from the baby, presenting lollipops to the children and then taking them away from them). Say what you will about her art, but she is an artist, and she does it to great effect: John McCain really is a man older than his years who looks out of touch and, if his rhetoric in his shameless pursuit of the Presidency is any indication, actually might want to eat your young. For the Democrats, this kind of unsolicited dissident art from a bomb-thrower in the rank-and-file doesn’t help in today’s hyper-reactive, image- and soundbite-manipulable media milieu. Everyone, whether the Democratic faithful or the Republicans who know in their heart that John McCain is the party’s worst choice for a nominee since…well…let’s just put it that Alf Landon and Bob Dole aren’t looking so bad right now. It’s already an old story that John McCain has sold his soul to become President. But the question is: When does the electorate-at-large start recognizing him as a lunatic? Partisan politics aside, no objective observer can deny that the Arizona Senator long ago lost any pretense of fairness and balance. Obvious apologies to FOXNews, but even this heretofore-loyal choir has been looking at their shoes and awkwardly asking if there was maybe a different preacher they could sing to. You know you’re failing Torpedo Politics 101 when Karl Rove and George Will suggest that you’re going too far. You also don’t help yourself when you come out on the day of the biggest economic hiccup in America in the last 79 years and insist, “the fundamentals of our economy are strong.” He may have been correct in that, as Thom Hartman pointed out on Air America, gold was experiencing record surges, which meant that someone still had money, even if it isn’t you or me or anyone on our street or within a five ZIP code-radius of us. But there’s politically tone-deaf, and there’s politically retarded, and with that dunderheaded, Pollyanna assessment of an American economy that was collapsing under the weight of its own debt, the McCain “Straight Talk Express” bus immediately turned yellow and shrank by 30 feet. There was a time when politicians didn’t try to get away with the lies that McCain has since he began his Presidential campaign in earnest. That was a time before 24-hour news channels. Now, the news machine is like a rapid-fire paintball gun, and most viewers can barely assess the daze and stun of one shot, before the next one comes, and so on and so on and so on, in tommy-gun succession. 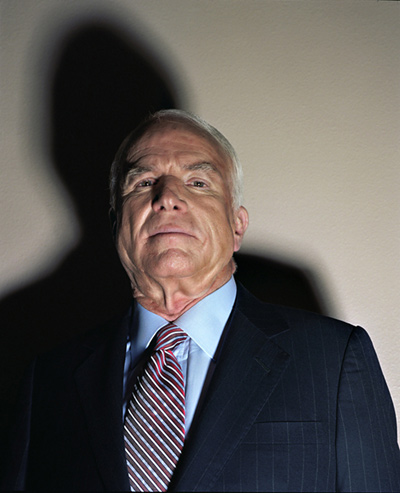 Senator McCain has taken the art of the lie to breathtaking new levels, and for writers looking for a new angle, every day gets more and more tired when all they can find for the big story is that he’s done it again. Different day, different topic, but the same brazen dishonesty. John McCain’s marble bag has been empty for at least a year now, but he’s been able to raise enough money to hire some top-shelf puppetmasters to commandeer the now-flaccid vessel that once housed his body and soul, and make him dance for the ones he brung. So far, he’s doing just what they’ve asked of him.